Supreme Court Justice Sonia Sotomayor criticized the majority opinion in Tuesday’s ruling upholding President Trump’s travel ban. Published June 26, 2018. As CBS News Chief legal correspondent Jan Crawford explains, Sotomayor wrote in her dissent that ruling ignored the president's own statements on the ban, which he had previously called a "Muslim ban." Sonia Sotomayor Delivers NYT Contd. For the next 20 minutes, she remained resolute as she delivered an extraordinarily scorching dissent, skewering the court’s decision and condemning the ban as “harrowing” and “motivated by hostility and animus toward the Muslim faith. ”The remarkable dissent was delivered by a woman who has championed her own upbringing as an example of the American dream. Justice Sotomayor, whose parents moved from Puerto Rico during World War II, was raised in a housing project in the Bronx. Her father did not speak English and her first language was Spanish. But determined to become a judge, she would go on to attend Princeton University and become the Supreme Court’s first Latina justice. The United States of America is a Nation built upon the promise of religious liberty. Our Founders honored that core promise by embedding the principle of religious neutrality in the First Amendment. masquerades behind a façade of national-security concerns. But this repackaging does little to cleanse Presidential Proclamation No. 9645 of the appearance of discrimination that the President’s words have created. Based on the evidence in the record, a reasonable observer would conclude that the Proclamation was motivated by anti-Muslim animus. That alone suffices to show the plaintiffs are likely to succeed on the merits of their Establishment Clause claim. The majority holds otherwise by ignoring the facts, misconstruing our legal precedent, and turning a blind eye to the pain and suffering the Proclamation inflicts upon countless families and individuals,many of whom are United States citizens. Because that troubling result runs contrary to the Constitution and our precedent, I dissent. Plaintiffs challenge the Proclamation on various grounds, both statutory and constitutional. Ordinarily, when a case can be decided on purely statutory grounds, we strive to follow a “prudential rule of avoiding constitutional questions.” Zobrest v. Catalina Foothills School Dist., 509 U. S. 1, 8 (1993). But that rule of thumb is far from categorical, and it has limited application where, as here, the constitutional question proves far simpler than the statutory one. Whatever the merits of plaintiffs’ complex statutory claims, the Proclamation must be enjoined for a more fundamental reason: It runs afoul of the Establishment Clause’s guarantee of religious neutrality. 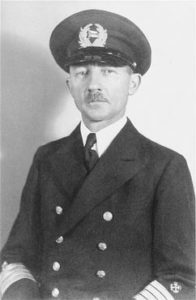 Gustav Schroeder, captain of the “St. Louis,” on the day of the ship’s departure from Hamburg. Neither Cuba nor the US granted refuge to the ship’s passengers. political community.’” Santa Fe Independent School Dist. v. Doe, 530 U. S. 290, 309 (2000). to another, or religion to irreligion”). religion. See id., at 862, 866; accord, Town of Greece v.
including contemporaneous statements made by” the decisionmaker. drafter’s heart of hearts.” Id., at 862.
and animus toward the Muslim faith. apocryphal story about United States General John J.
they don’t respect other things.” Ibid. to describe his policy proposal in slightly different terms. “where there’s a proven history of terrorism.” Id., at 121.
through a failed immigration system.” Id., at 121–122. when [he] used the word Muslim.” Id., at 123.
vetting from certain areas of the world.” Ibid. proven to be right.” Ibid. looked up, and said “We all know what that means.” App. 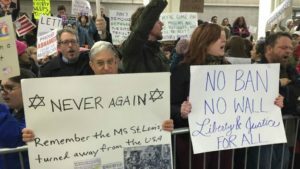 were a Christian, it was almost impossible.” Id., at 125.
entry and refugee bans. See Exec. Order No. (IRAP) v. Trump, 241 F. Supp. 3d 539, 566 (Md. 2017). Trump v. IRAP, 582 U. S. ___, ___ (2017) (slip op., at 12). in the Philippines: “Study what General Pershing . . .
Twitter are “official statements.” App. 133.
not whether to denounce” these offensive statements. U. S., at 862–863. The answer is unquestionably yes. detailed above, see supra, at 6–10. unrelenting attack on the Muslim religion and its followers. the failure to disavow them to be constitutionally significant. 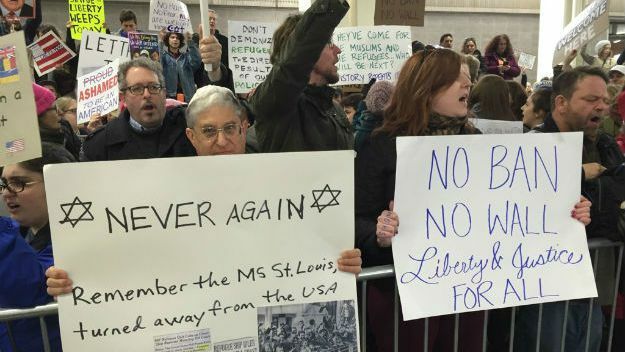 promise to ban Muslims from entering the country. requires”). It should find the same here. facts.” Tr. of Oral Arg. 16.
foreign national under a specific statutory ground of inadmissibility. U. S., at 534. Likewise, the majority’s passing invocation of Fiallo v.
to enact a Muslim ban, App. 125; see supra, at 4–10. review of the Proclamation to rational-basis scrutiny. heightened standard. See supra, at 10–13. when individual liberties are at stake.” Hamdi v. Rumsfeld, 542 U. S.
at the mere mention of a national-security concern. Ante, at 32, n. 5. 508 U. S., at 535. ‘by-and-large . . . resist assimilation.’” Id., at 14.
the Proclamation and the President’s anti-Muslim statements. various forms) to anti-Muslim animus. "Congress shall make no law respecting an establishment of religion...."Catie EdmondsonCite as: 585 U. S. ____ (2018) 1Constitution of United States of America 1789 (rev. 1992)Jan Crawford CBS NewsJustice Anthony Kennedy resignsNew York TimesPresidential Proclamation No. 9645Sotomayer Dissent Travel Ban Full TextSupreme Court Justice Sonia SotomayorWill abortion in the US be illegal by next year?Will Trump succeed in placing a second nominee to the Supreme Court?